conducting at the Adelaide Guitar Festival Summer School 2016. Richard Charlton was born in England in 1955 and first came to Australia at the age of eight. He started playing the guitar only relatively late in life, at the age of 16, and has remained predominantly self-taught, gaining an LTCL Teachers' Diploma in 1980. He was a founding member of the Sydney Guitar Quartet in 1981 and for a period of ten years performed his own music with this group throughout NSW and the ACT. Richard was also a member of the Bennelong Players from 1985 to 1990 when the group was based at the Sydney Opera House. Always in demand as a performer, Richard has worked with many leading Sydney musicians. 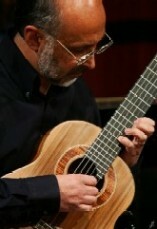 He presently performs with the "Sydney Guitar Trio" along with Raffaele and Janet Agostino. In 2001 the trio toured to Argentina, England & Italy with an all-Australian programme, including 2 of Richard's pieces. While in the UK Richard presented a lecture on guitar composition at the Guildhall School of Music & Drama and taught (with the other members of the trio) in a masterclass at the Royal College of Music. Richard is on staff at Ascham School, a private day & boarding school in Sydney and was the Director of Music Performance for many years. As well as co-ordinating the Guitar Programme, he teaches, conducts and composes for the school's choirs & orchestras. Member of the Sydney Guitar Trio 1996 to present. Featured Composer at the 1997 & 2005 Darwin International Guitar Festivals. Adjudicator - Adelaide Guitar Festival Competition, Penrith Eistedfodd, McDonald's Performing Arts Challenge (guitar section), Australian Guitar Competition (Newcastle) 2000 & 2004. Specialist in forming and conducting large Guitar Ensembles. Tutor & conductor for the Sydney Guitar Summer School.